Lipo Spray Coating Services added 5 photos to the album - Residential . Lipo Spray Coating Services added 9 photos to the album - Residential . Lipo Spray Coating Services added 5 photos to the album - Sand Stone Coating. Lipo Spray Coating Services added 5 photos in Graniterior EX Category. Lipo Spray Coating Services added 3 photos in Milano Corotta Category. Lipo Spray Coating Services added 4 photos in Sand Elegante Category. Lipo Spray Coating Services added 10 photos in Bell-Art Pattern Sample Category. Lipo Spray Coating Services added 3 photos in G - Multi-Fancy Category. 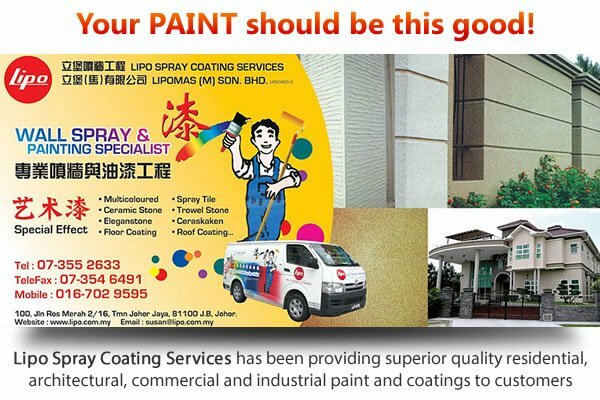 Lipo Spray Coating Services added 3 photos in SK Multi-Fancy Category. Lipo Spray Coating Services added 3 photos in Lenaluck Category. Lipo Spray Coating Services added 3 photos in Granipastel Category. Lipo Spray Coating Services added 4 photos in Elegance Tile TS Category. Lipo Spray Coating Services added 3 photos in Ceraskaken Category. Lipo Spray Coating Services added 4 photos in Eleganstone Series Category. Address: 100, Jalan Ros Merah 2/16, Taman Johor Jaya, 81100 Johor Bahru, Johor, Malaysia.